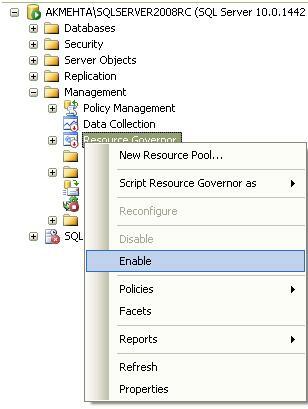 SQL Server 2008 introduces a new feature called Resource Governor which enables Database Administrators to manage SQL Server workload and critical system resource consumption. Resource Governor enables DBA to specify limits on the amount of CPU and memory which the incoming sessions to the SQL Server can use. In a production environment DBA’s will come across scenarios when there could be sudden spike in CPU and memory utilization thereby resulting in slow responses to query requests. These issues happen when there is unpredicted workload execution like long running TSQL queries, database backups being performed etc. The solution to these issues is the use of Resource Governor which enables DBA’s to differentiate workloads and allocate shared resources as they are requested, based on limits you specify for resources like CPU and memory. 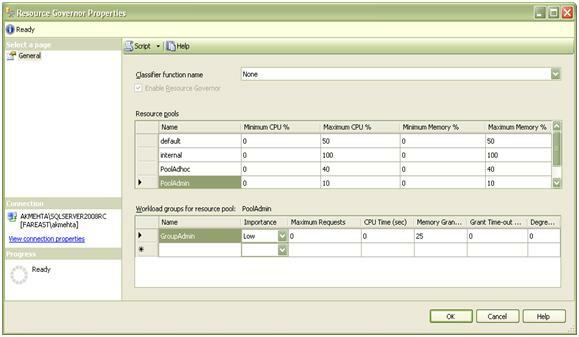 The resource governor limits can easily be reconfigured in real time with minimal impact on the workloads that are executing. The following three concepts are fundamental to the understanding and usage of Resource Governor. Resource Pool: – A resource pool represents the physical resources of the server. There are two resource pool namely internal and default which are created when SQL Server 2008 is installed. However, SQL Server also supports the creation of user defined resource pools. 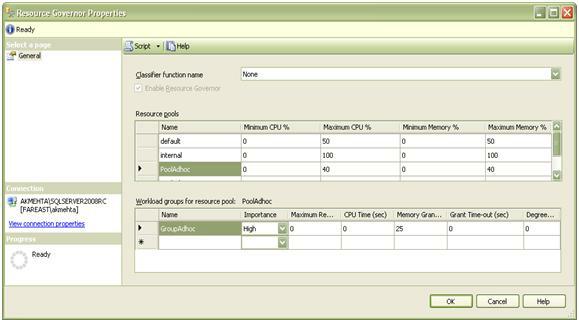 In a resource pool a DBA can specify MIN or MAX value in percentages for CPU and Memory utilization. The Internal pool basically represents the resources which are consumed by SQL Server itself for its running. This pool cannot be altered by a user in any way. The default pool is a predefined user pool which contains the default group. The important thing to note is that the default pool cannot be dropped or created, however it can be altered as required. Classification: – Classifications are internal rules that classify the incoming requests and route then to a workload group. This classification is based on a set of user written criteria contained in a scalar function which will be created in the Master database. Once a DBA enables the Resource Governor on SQL Server then each and every single session to the server will be evaluated by the user defined classifier function. Resource Governor is by default disabled when SQL Server 2008 is installed. To enable it using SQL Server Management Studio you need to follow the below steps. 5. Execute the following TSQL query to confirm that there is no pending reconfiguration of the resource governor because of changes in configuration, and the Resource Governor’s configuration metadata matches it’s in memory configuration. The expected value for is_reconfiguration_pending should be 0. 2. 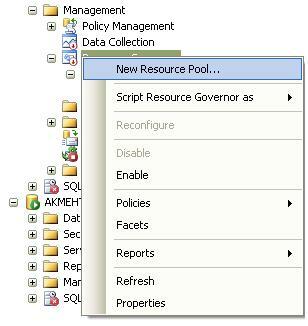 Right click Resource Governor, and then click New Resource Pool, This will open the Resource Governor Properties page. 4. In the Workload groups for resource pool for PoolAdhoc, double the first column and provide the value values as shown in the snippet for Name, importance, Maximum Requests, CPU Time (sec), Memory Grant %, Grant Time-out (sec) and Degree of Parallelism. 5. A DBA also needs to alter the default resource pool with the values as shown in the snippet and then click OK to save the changes. 6. Now let’s create one more Resource Pool named PoolAdmin and a Workload Group named GroupAdmin with the values as shown in the below snippet and then click OK to save the changes. The below TSQL query needs to be executed on the Master database to create a classification function.